From our dear spiritual brother KICHEM we have a personal testimony about the myrrh-gushing icon of St. George. My brethren, I have just returned with my family from a pilgrimage to St. George in the village of Kambi in Farmaka. One hour traveling full of anticipation brought us before the beautiful church in the village, and although it was late at 9:00PM, there were still pilgrims who gathered by the grace of our Saint. The people were simple, happy and laughing both outside and inside the church. With child-like anxiousness we took our place, we approached, and we kissed the icon in order for it to bathe us with its grace and fragrance. As you can see from the photo below, the course of the myrrh is obvious, which began from the top, to the left of the head of the Saint, even though today it was limited. The priest was making cross-wise marks with oil on its acrylic cover and distributing it to the people. I asked for the details to the story and with great joy Father Polydoros and the commissioner Mr. Anthony, together with some women who were present all these days to protect the church, gave it to us for the world to know better. The phenomenon seems to have began on Sunday, although it existed to a limited extent, unbeknownst to all. Therefore, beginning on Sunday one villager simply saw something and reported it as unusual, but the problem came during the procession, when those who held the icon noticed it was heavy. Especially on Monday, it took six people to lift it, as they told me. On Monday towards Tuesday, it seems that the myrrh reached its peak, with testimonies that the icon was fragrant while on the road towards the church. The outflow of liquid which they saw, occurred in at least two places on the icon. The distinctive Priest did not immediately want it to be known, and he contacted the responsible Bishop, Metropolitan Isaiah of Tamasos and Oreinis, who undertook an examination of the phenomenon. He immediately called specialists from the antiquities museum and the Archdiocese, and indeed, I was told that the iconologist went to the church at 10 at night because the Metropolitan is very ordered and considered that it would be good for his flock to perform a Liturgy quickly, which he did. The experts concluded that the happening could not be explained scientifically and it was probably supernatural, and therefore a miracle. It was determined that the myrrh was gushing from the inside, beneath the varnish, which is why it was moistening the icon externally, and a hidden stream formed on its surface, which had almost solidifed (at least when I saw it). This can also be seen in the photographs. Perhaps this is the reason why it is said the icon gained weight. Of course, they told me that for many hours, the icon of myrrh was changing - and perhaps changed again - and appeared to be fluid, but by the instruction of the Bishop, there was placed around the icon a protective cover, so that the faithful would be prevented from touching and scratching the icon and inadvertently harming it. It is worth mentioning that at times the icon flowed more myrrh, and at other times the fragrance became more intense, presumably because people would come and sit for a long time praying, or because the faith of some was more shallow and the Saint allowed, by the grace of God, for the phenomenon to more intensely burn within their heart. It was also moving, according to testimonies, that the face of St. George, especially on Monday, was so lively that it seemed as though he would talk. From the time this became known, the church remains open until 10 every night, with the priest ministering to the people, and they intend to keep it this way until people stop coming. It should be noted that it is not permitted for anyone to be allowed to take advantage of this happening, so that no one outside is selling anything, as often happens, specifically so that the people will not be scandalized in order from the outset there would not be an aim toward economic benefit. 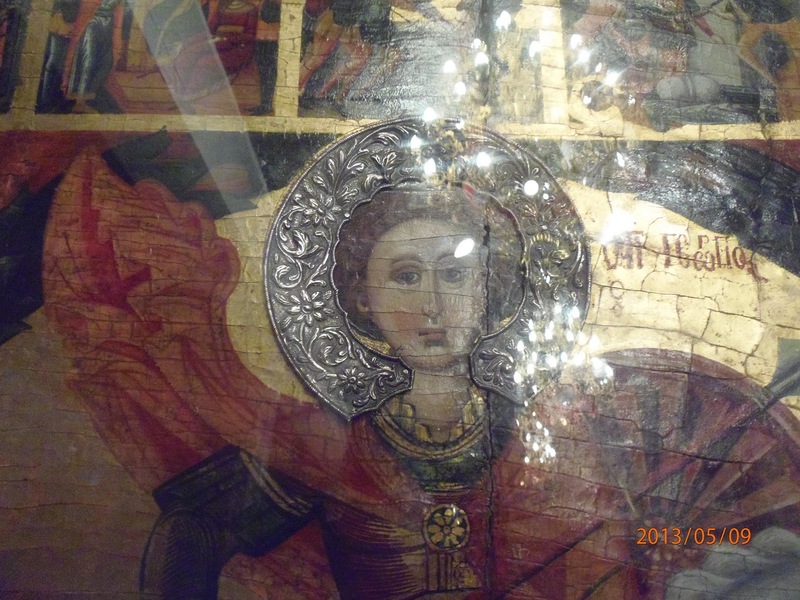 In closing, I want to mention that the church is unique because it has two icons of St. George on its icon-screen, the second being on the left edge of the icon-screen and cannot be seen in the photos - and they have particular ecclesiastical value, let alone spiritual value for the event.